William Shuart, environmental technology coordinator with Virginia Commonwealth University, launches his Cumulus drone to map wind speeds, terrain as part of the study to measure fluctuating ozone levels. On sun-baked, humid days, most people avoid the outdoors—but not scientists trying to measure fluctuating ozone levels in East Coast cities. “It’s hot, it’s humid and it’s ideal for us,” Joel Dreessen, a meteorologist with the Maryland Department of the Environment’s air quality program, told Bloomberg Environment, as he stepped off the agency’s boat onto Hart-Miller Island, a dot of land made from dredged material in the Chesapeake Bay near the mouth of the Middle River. The temperatures soared into the nineties June 18, and local agencies in the Baltimore and Washington, D.C., region had declared it a bad air day. Dreessen had come to see a team of NASA scientists and college students launch drones and balloons equipped with instruments to measure smog-forming pollutants over the water. These scientists are trying to pin down why ozone levels are generally higher along the Northeast corridor where many coastal cities remain out of compliance with the Environmental Protection Agency’s national air quality standard for ground-level ozone of 70 parts per billion in the summer. While the studies are still in the early stages, the data that scientists collect about pollutants’ rate of reactions, combined with wind speed and direction, will provide chemical fingerprints about ozone formation. That knowledge, in turn, will help policy makers from Virginia to Rhode Island identify pollution sources for targeted reductions. “None of the regulatory agenda moves forward unless we have science and monitoring and data behind it, and this is what these studies will provide us,” Benjamin Grumbles, Maryland’s secretary for environment, told Bloomberg Environment June 18 en route to the island that serves as the habitat to osprey, egrets, ducks, and other waterfowl. Ground-level ozone is largely a summertime pollutant that can cause, even at low levels, respiratory problems. It’s formed when nitrogen oxides and volatile organic compounds—air pollutants from fossil fuels burned in stationary or mobile engines or power plants—react in the presence of sunlight. Diverse weather patterns, however, can promote or dampen the evolution and transport of a polluted air mass across the region. Scientists want to understand the differences in the air pollution that travels back and forth between land and bodies of water like the Chesapeake Bay, John Sullivan, researcher with NASA Goddard Flight Space Center in Greenbelt, Md., told Bloomberg Environment. “We already had data collected on land that we could use to infer how ozone is formed over water, but we lacked direct and real-time observations to confirm this,” Sullivan, who is leading the Ozone-Water-Land-Environmental Transition Study-2, or OWLETS-22 study in Maryland, added. The second phase of the OWLET study builds on the observations made a year ago in the lower Chesapeake Bay in Southern Virginia. Researchers at NASA Langley Research Center in Hampton, Va., joined forces with their colleagues at the Goddard Space Flight Center and Hampton University to measure ozone levels at the lab as well as over the water near the Chesapeake Bay Bridge-Tunnel, which stretches 20 miles from Virginia Beach to the southern tip of Virginia’s Eastern Shore. Lance Nino, an undergraduate majoring in atmospheric studies at Cornell University, oversees the ozone sounds, or sensors attached to a balloon. He and another student assist Rose Nguyen, an electrical engineering student at Hampton University in Virginia, who held onto the helium-filled balloon until its launch time. The scientists’ goal on Hart-Miller Island is to observe, monitor, and collect data to support the bay breeze effect, which Sullivan describes as the phenomenon that can drastically worsen air quality on hot, stagnant summer days. This effect was observed a year ago when the scientists conducted their initial measurements in the lower Chesapeake Bay in Virginia. Typical wind patterns blow nitrogen oxides and other ozone-forming pollutants over the Chesapeake Bay. As the day progresses, the winds die down, creating a stagnant bank of pollutants over the water that bakes in the sun and forms ozone at the lower levels of the atmosphere. The afternoon heating, however, also creates a sea breeze that blows this pollution back inland, resulting in higher concentrations in the metro areas. But the burning question facing Sullivan and his team is whether ozone concentrations that return inland are more than the precursors that were blown out over the water. They also want to find out whether spikes in ozone levels are caused by less well understood pollution sources, such as ships, tankers, and other vessels plying the Chesapeake Bay. At the edge of Hart-Miller Island, Sean Flynn, chief executive officer and senior pilot for the Peninsula Drone Services LLC, and William Shuart, environmental data management instructor at the Virginia Commonwealth University’s Center for Environmental Studies, have set up camp to assemble the drones they plan to fly when the sun begins to ascend across the horizon. Perched on a fence along the island’s edge is a telescope-like-instrument that measures how sunlight is absorbed by various air polluting gases and aerosols across different layers of the atmosphere, while a radiometer sitting next to it measures changes in humidity, temperature, and sunlight over the bay. 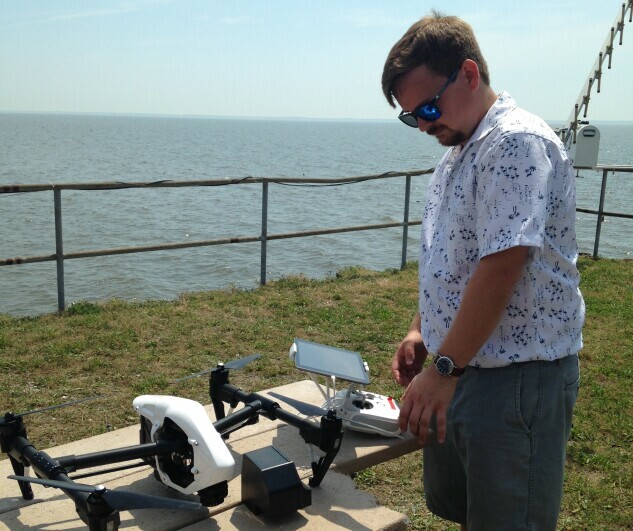 Sean Flynn, CEO of Peninsula Drone Services LLC, readies his drone for flight June 18 over the Hart Miller Island in Maryland. 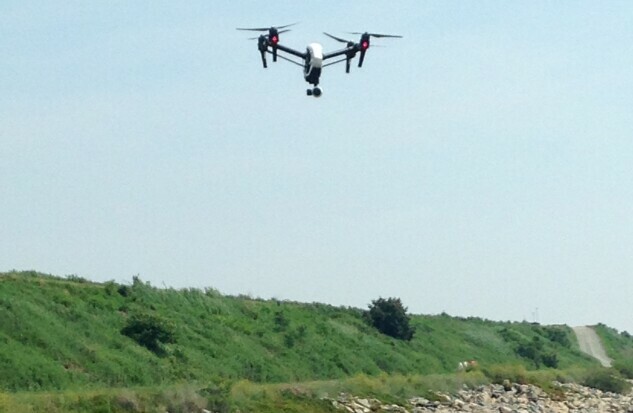 The drone was equipped with a sensor that measured ozone levels above the surface of the Chesapeake Bay and at least 100 feet above the surface that day. In front of the fence are four plastic bags, which ostensibly look like a row of trash bags, but are designed to protect the metal canisters that measure volatile organic compounds. A few yards away stand two trailers with instruments from the University of Maryland, Baltimore County, National Oceanic and Atmospheric Administration, and NASA. They contain surface level pollutant analyzers, lidars, and room to prepare and release weather balloons. Once aloft, Flynn’s spider-like drone will measure ozone levels at altitudes ranging from just above the water’s surface to higher than 300 feet, while Shuart’s drone will measure wind speeds, direction, temperature, and humidity. “This is a laboratory for measuring not only ozone and how it accumulates over bodies of water, but also where it comes from and why it’s accumulating,” Grumbles said, pointing to an array of instruments on display, waiting for the drones to take flight. The team released a helium-filled white balloon containing sensors to measure vertical profiles of ozone, temperature, pressure, winds, and humidity as it climbs through the atmosphere. The drone piloted by Sean Flynn, of Peninsula Drone Services LLC, skims the terrain near the Chesapeake Bay off Hart Miller Island. For the next few days, these scientists will collect as much data as they can about ozone formation before it starts to rain. The data the drones and balloons gather will complement information gathered by mobile trucks measuring volatile organic compounds and similar measurements on land, enabling scientists to draw a three-dimensional picture of how ground level ozone is formed over the bay during the course of the day. The results may help state officials in the Northeast meet the 2015 standards for ozone, but it can can take time for policy to catch up with the science, especially as the research is ongoing. The data will help refine the emissions that are used in models, which are used by state agencies to set up control strategies for ozone, Paul Miller, deputy director and chief scientist at NESCAUM, the Northeast’s clean air association in Boston, told Bloomberg Environment.